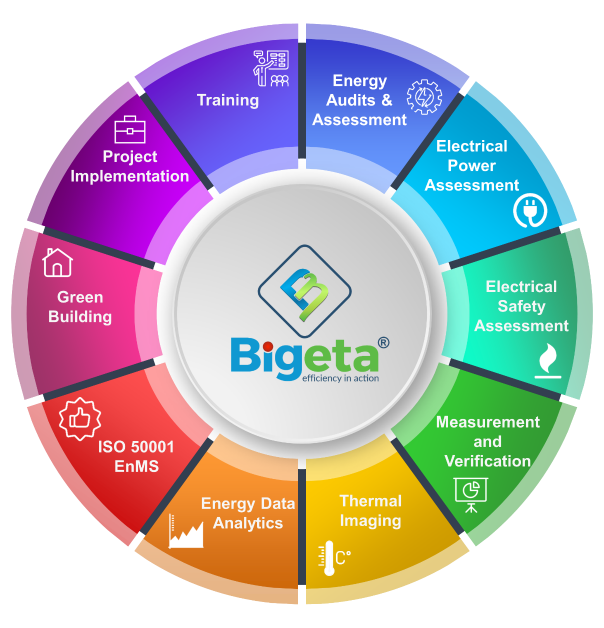 Bigeta Energy Solutions LLP is an Energy & Sustainability Management company. We provide consultancy services in Energy Audits & Assessments, Electrical Power Assessment, Electrical Safety Assessment, Measurement & Verification, Thermal Imaging, Energy Data Analytics, ISO 50001 EnMS and Training. We are a team of BEE accredited energy auditor, BEE certified energy auditor, energy manager, Certified Measurement and Verification Professional (CMVP), ISO 50001 lead auditor, IGBC Accredited Professional(IGBC AP), GRIHA Certified Professional and power quality professionals committed to giving most promising solutions to customers to save energy and attain sustainability. Energy consumption across the entire planet shows a drastic increase with every year. The world’s energy demand is expected to increase by 37% by 2040. Along with this energy demand, we can also see that energy cost is also increasing leading to higher production cost. Other than economic aspects, the present scenario has a great impact on environmental sustainability. Focusing on Energy Efficiency and Sustainability, we are offering services and solutions that can reduce the stress on energy demand. Our services include energy auditing, electrical power assessment, electrical safety assessment, measurement and verification, thermal imaging, energy data analytics, ISO 50001 Energy Management System, green building, project implementation and training.